Super proud of myself that this one finally got finished. Baby Emma was born in April, so better late than never! I have another one that is very similar that I made for our baby. I am slowly binding it while watching television the few nights we have been home. We are trying to pack in a lot of last minute catch ups and entertaining before the new baby arrives. This quilt pattern came from the Material Obsession Two book and the pattern is called, “Playground Days”. Very easy to make and a bright cheerful quilt for the next generation. A good friend of ours recently gave birth to a baby girl. Unfortunately my friend is very against pink which dampened my plans to sew a pink concoction for her new baby. 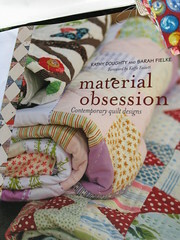 Material Obsession’s second book did not fail to bring me some inspiration. 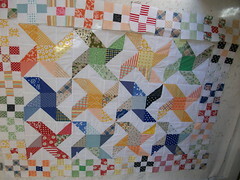 I love the fresh, bright primary colors in this quilt. 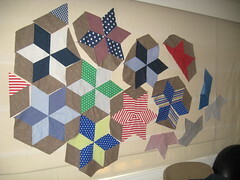 Here is my version on the design wall at my class and now has been sewn up and awaiting backing and quilting. I made another one at the same time for another bub on the way and it was such a fun stash buster too. I indulged in a few new fabric purchases at the show, so need to sew up some of the old! Yesterday I had to say good-bye to my machine which is getting a much delayed service. It has been running really well, but I thought I should have it looked at while we are away for a week. They broke the news yesterday it is going to be a two week turn around!!! I have plenty of other things to finish, so a self imposed break will not be bad. School holidays are in force. Day one was ugly, but slowly hitting our groove. Happy sewing all! I fell in love with this fabric and it has just been waiting for the right project. 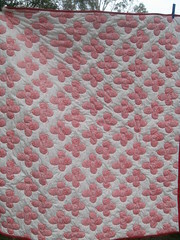 I started with a simple red, hand quilted outline of each of the flowers. The back is a plain white muslin which looks like another quilt on the reverse with the red and white quilting flower outlines. 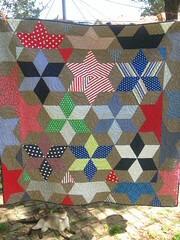 I have always loved that strong contrast of red and white and blue and white quilts. We are in the full swing of school holidays. Zoo visit check (twice), beach visit check, multiple parks and bike parks check. Sick kids (just colds) check. I am hoping for an aquarium visit tomorrow provided runny noses and attitudes have improved over night. I just kicked off a new quilting project and loving it. I will post some sneak peaks later this week. 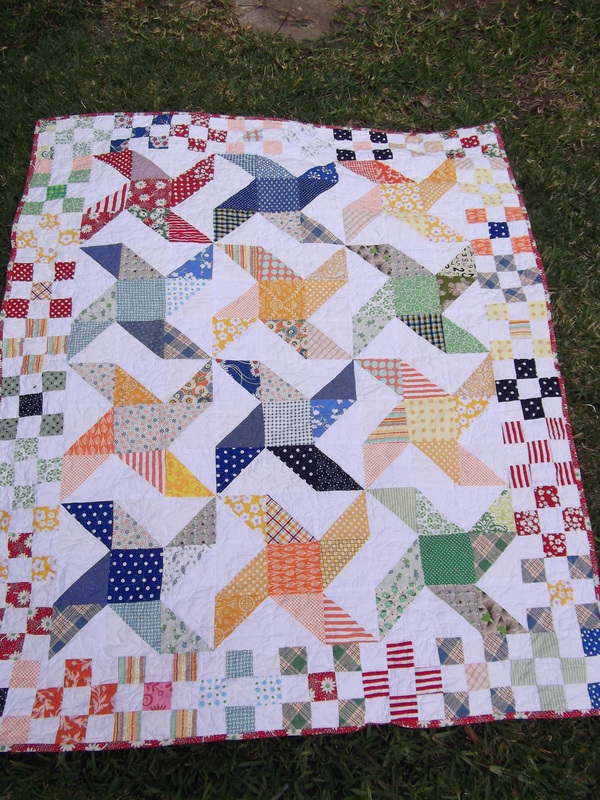 I admit…..I bit off more than I could chew with the two quilts, but they are done! I finished the binding on this one last night which is perfect timing right before we head out on holidays. Rhys’ timing on getting sick with a high, high fever however is not jiving with the holiday. We are having a quiet day today. This quilt was another Kaffe Fassett number. Check out our cat CoCo underneath. How cute is that? The quilt is far from perfect. I found this pattern really hard and not all the triangles are perfectly matched on points etc. The good news is after it has been quilted it doesn’t look as obvious. It is definitely a pattern I wish I could have done a class on or had some pointers. Next challenge, mailing them to Q’land. That is a project for next week. Have a great school holiday break! How great is this? We are renting right now and this is the fabric blind in the living room which happen to double as my sewing room. I have been using it as my design wall! The baby quilt has turned out to be massive. I really like it and I am down to the very last border after a few sewing like a demon nights. I am too tired to sew tonight, so doing some much needed computer catch up. School holidays are so fun, but I am tired from trying to tire them out! Has anyone seen the Anna Maria Horner pillowcase dress? I am so dying to try this out when Sloan gets older. Darling. Things are looking up! Got my computer back after a quick hiatus. Bad news is the techo confirmed it is a hardware issue so it will have to take a holiday to the computer doctor soon. I am really over technical difficulties. I bought this book at the Sydney Quilt show last month. Oh My! It is filled with so many projects and just too little time in my world to complete them. I have my eye on one project in particular, but sticking to my having to finish something before I can start a new one. Such a stupid rule. I also bought two other patterns and fabric from their booth which I posted on flickr. It was such a highlight to see Kathy and Sarah. They are true living artists in our quilting community and we are so lucky they published this book sharing their patterns and ideas. Anyone out there watching, “A Farmer Wants A Wife”. Embarrassed to admit just how much I love this show. On tonight! 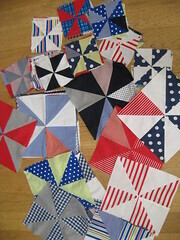 All the pinwheels are assembled and waiting final trimming. I really like how they look, but hope they aren’t too busy when they are together. I need to start laying them out to see how busy is busy. My parent arrive tomorrow morning from the USA for the month of April. I am going to try and keep up a few posts, but visiting grandparents trump sewing and crafting.